River Media's Highest Quality CDR! Now metalized to the centre for a solid full surface print! ! CD-R is a "write once" technology that can be used in both CD-R and CD-RW recorders and read by nearly any computer CD drive or audio CD player. In a CD-R the recording layer is made with organic dyes � greenish cyanine dye, golden phthalocyanine dye, or silver-blue azo dye. The laser of your CD-R/CD-RW drive heats the dye to a temperature of about 200� C, irreversibly melting a pitted pattern into the recording layer. A plastic layer alongside the dye expands into the newly available space creating a pit pattern similar to that of a conventional CD. Your CD player reads this highly reflective pattern for playback. Because the plastic layer melts into the dye layer to set the pattern, CD-R discs cannot be re-recorded. Unlike a stamped CD, CD-Rs are manufactured with a spiral groove (like a phono disc) called the pregroove. It provides a precise track for the writing laser to follow. A CD player depends on following the recorded track of pits in order to track the spiral path. Phthalocyanine dye is superior to the Cyanine dye used in other CD -R products for two reasons. One, Phthalocyanine dye is far more stable than Cyanine. The information recorded on a Phthalocyanine dye CD-R will last for over 100 years. Cyanine based products might last 20 years. Secondly, Phthalocyanine dye is optimised for use in higher speed writers. This success is due to the accuracy with which laser light is able to create "pits" in the Pthalocyanine surface. Pits etched into Cyanine-based disks at high speed can be shallow or poorly defined, resulting in a poorly written disc. 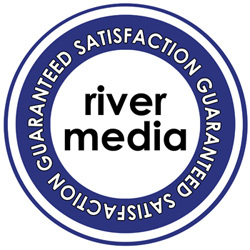 What Makes River Media CDRs the professionals best kept secret? River Media Diamond Phthalocyanine CDRs have outperformed Cyanine in a series of tests when subjected to light, heat, and dampness. These test results below highlight the difference. River Media CDRs also have amongst the lowest C1 & C2 errors in the industry. While a high level of C1, correctable errors, will still probably be read by CD players and CD-Rom drives without too much difficulty, C2 errors are more likely to be unresolvable and result in the deadly CU, an uncorrectable error. A CU error will be noticed by audio dropouts and and unwanted artefacts or read failures on CD Roms. A high level of errors will put more strain on error correction circuitry and will force CD Players to interpolate samples to get a reasonable value. This is what can result in noticeable audio differences when played on high quality monitors or audiophile standard hi-fi. A great,value for money product that arrived the next day and a very professional, helpful service.These guys are willing to go the extra mile to make sure you get the right product for your needs - I've already placed another order! Select the needed Check box and click buy of RIVER CDR80 Prem White Diamond Inkjet.